Akinesia (α- a-, "without", κίνησις kinēsis, "motion") Inability to initiate movement is due to difficulty selecting and/or activating motor programs in the central nervous system. Common in severe cases of Parkinson's disease, akinesia is a result of severely diminished dopaminergic cell activity in the direct pathway of movement. 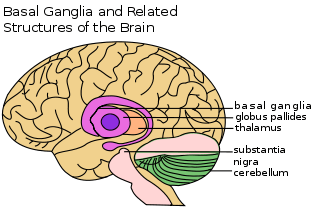 Bradykinesia (βραδύς bradys, "slow", κίνησις kinēsis, "motion") Characterized by slowness of movement, it has been linked to Parkinson's disease and other disorders of the basal ganglia. Rather than being a slowness in initiation (akinesia), bradykinesia describes a slowness in the execution of movement. It is one of the four key symptoms of parkinsonism, which are bradykinesia, tremor, rigidity, and postural instability. Bradykinesia is also the cause of what is normally referred to as "stone face" (expressionless face) among those with Parkinson's. Dystonia Patients experience muscle twisting, repetition, and abnormal postures. The disease could be caused by genetics or a variety of environmental factors such as reaction to drugs or birth-related trauma. Leadpipe rigidity results when an increase in muscle tone causes a sustained resistance to passive movement throughout the whole range of motion, with no fluctuations. Cogwheel rigidity is a combination of lead-pipe rigidity and tremor which presents as a jerky resistance to passive movement as muscles tense and relax. Once the reaction to dopaminergic drugs begins to fluctuate in Parkinson’s patients, deep brain stimulation (DBS) of the subthalamic nucleus and medial globus pallidus is often used to treat hypokinesia. DBS, like dopaminergic drugs, initially provides relief, but chronic use causes worse hypokinesia and freezing of gait. Lower-frequency DBS in irregular patterns has been shown to be more effective and less detrimental in treatment. Often debated is whether the efficiency, vigor, and speed of movements in patients with hypokinesia are tied to motivation for rewarding and against punishing stimuli. The basal ganglia have been tied to the incentives behind movement, therefore suggesting a cost/benefit analysis of planned movement could be affected in hypokinesia. Interestingly, rewards have not been shown to change the aspects of a hypokinesic individual’s movement. 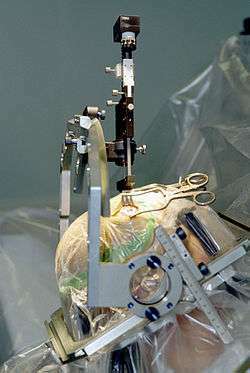 In fact, the motor planning and control of a patient with hypokinesia is already as efficient as possible (as shown by slightly faster, but generally the same movement after deep brain stimulation of the subthalamic nucleus). This suggests that hypokinetic individuals simply have a narrower range of movement that does not increase relative to motivation. ↑ Kolb, B. Whishaw, I. (2011) An Introduction to Brain and Behavior, 373. ↑ Yorkston, Kathryn M.; Mark Hakel; David R. Beukelman; Susan Fager (June 2007). "Evidence for effectiveness of treatment of loudness, rate, or prosody in dysarthria: A systematic review.". Journal of Medical Speech-Language Pathology. 15 (2): xi–xxxvi. 1 2 Robottom, Bradley J. (1 May 2011). "Movement Disorders Emergencies Part 1". Archives of Neurology. 68 (5): 567. doi:10.1001/archneurol.2011.84. ↑ Robottom, Bradley J. (9 May 2011). "Movement Disorders Emergencies Part 1: Hypokinetic Disorders". Archives of Neurology. 68 (5): 567. doi:10.1001/archneurol.2011.84. ↑ O'Sullivan SB, Schmitz TJ (2007). "Parkinson's Disease". Physical Rehabilitation. 5. Philadelphia: F.A Davis Company. pp. 856–857. ISBN 978-0-80-362579-2. 1 2 3 4 Domellöf, Magdalena Eriksson; Elgh, Eva; Forsgren, Lars (October 2011). "The relation between cognition and motor dysfunction in drug-naive newly diagnosed patients with Parkinson's disease". Movement Disorders. 26 (12): 2183–2189. doi:10.1002/mds.23814. 1 2 3 4 5 6 7 8 Vingerhoets, FJ; Schulzer, M; Calne, DB; Snow, BJ (Jan 1997). "Which clinical sign of Parkinson's disease best reflects the nigrostriatal lesion?". Annals of Neurology. 41 (1): 58–64. doi:10.1002/ana.410410111. PMID 9005866. 1 2 3 4 5 6 7 8 9 10 11 Moreau C, Delval A, Defebvre L, Dujardin K, Duhamel A, Petyt G, Vuillaume I, Corvol JC, Brefel-Courbon C, Ory-Magne F, Guehl D, Eusebio A, Fraix V, Saulnier PJ, Lagha-Boukbiza O, Durif F, Faighel M, Giordana C, Drapier S, Maltête D, Tranchant C, Houeto JL, Debû B, Sablonniere B, Azulay JP, Tison F, Rascol O, Vidailhet M, Destée A, Bloem BR, Bordet R, Devos D (July 2012). "Methylphenidate for gait hypokinesia and freezing in patients with Parkinson's disease undergoing subthalamic stimulation: a multicentre, parallel, randomised, placebo-controlled trial". The Lancet Neurology. 11 (7): 589–596. doi:10.1016/S1474-4422(12)70106-0. PMID 22658702. 1 2 Llansola, M; Montoliu, C; Cauli, O; Hernández-Rabaza, V; Agustí, A; Cabrera-Pastor, A; Giménez-Garzó, C; González-Usano, A; Felipo, V (June 2013). "Chronic hyperammonemia, glutamatergic neurotransmission and neurological alterations.". Metabolic brain disease. 28 (2): 151–4. doi:10.1007/s11011-012-9337-3. PMID 23010935. ↑ Ortez, C; Jou, C; Cortès-Saladelafont, E; Moreno, J; Pérez, A; Ormazábal, A; Pérez-Cerdá, C; Pérez, B; Artuch, R; Cusi, V; García-Cazorla, A (Dec 15, 2013). "Infantile parkinsonism and gabaergic hypotransmission in a patient with pyruvate carboxylase deficiency.". Gene. 532 (2): 302–6. doi:10.1016/j.gene.2013.08.036. PMID 23973720. ↑ González-Hernández, T; Barroso-Chinea, P; Acevedo, A; Salido, E; Rodríguez, M (January 2001). "Colocalization of tyrosine hydroxylase and GAD65 mRNA in mesostriatal neurons.". The European Journal of Neuroscience. 13 (1): 57–67. doi:10.1111/j.1460-9568.2001.01371.x. PMID 11135004. 1 2 3 4 Whelan, Brooke-Mai; Murdoch, Bruce E.; Theodoros, Deborah G.; Silburn, Peter A.; Hall, Bruce (September 2005). "Borrowing from models of motor control to translate cognitive processes: Evidence for hypokinetic–hyperkinetic linguistic homologues?". Journal of Neurolinguistics. 18 (5): 361–381. doi:10.1016/j.jneuroling.2004.05.002. ↑ Akbari, A.; Gharibzadeh, S. (23 September 2009). "Oscillations as the Cause of Both Hyper- and Hypokinetic Symptoms of Movement Disorders". Journal of Neuropsychiatry. 21 (3): 352–352. doi:10.1176/appi.neuropsych.21.3.352. ↑ Louter, Maartje; Munneke, Marten; Bloem, Bastiaan R.; Overeem, Sebastiaan (June 2012). "Nocturnal Hypokinesia and Sleep Quality in Parkinson's Disease". Journal of the American Geriatrics Society. 60 (6): 1104–1108. doi:10.1111/j.1532-5415.2012.03966.x. ↑ Blomstedt, P; Fytagoridis, A; Åström, M; Linder, J; Forsgren, L; Hariz, MI (December 2012). "Unilateral caudal zona incerta deep brain stimulation for Parkinsonian tremor.". Parkinsonism & related disorders. 18 (10): 1062–6. doi:10.1016/j.parkreldis.2012.05.024. PMID 22709794. 1 2 Brocker, DT; Swan, BD; Turner, DA; Gross, RE; Tatter, SB; Koop, MM; Bronte-Stewart, H; Grill, WM (January 2013). "Improved efficacy of temporally non-regular deep brain stimulation in Parkinson's disease.". Experimental neurology. 239: 60–7. doi:10.1016/j.expneurol.2012.09.008. PMID 23022917. 1 2 Xie, T; Kang, UJ; Warnke, P (October 2012). "Effect of stimulation frequency on immediate freezing of gait in newly activated STN DBS in Parkinson's disease.". Journal of neurology, neurosurgery, and psychiatry. 83 (10): 1015–7. doi:10.1136/jnnp-2011-302091. PMID 22696586. 1 2 Alarcón, Fernando; Giménez-Roldán, Santiago (January 2005). "Systemic diseases that cause movement disorders". Parkinsonism & Related Disorders. 11 (1): 1–18. doi:10.1016/j.parkreldis.2004.10.003. ↑ CALIGIURI, M (April 1989). "The influence of speaking rate on articulatory hypokinesia in parkinsonian dysarthria*1". Brain and Language. 36 (3): 493–502. doi:10.1016/0093-934X(89)90080-1. 1 2 Ling, H.; Massey, L. A.; Lees, A. J.; Brown, P.; Day, B. L. (6 March 2012). "Hypokinesia without decrement distinguishes progressive supranuclear palsy from Parkinson's disease". Brain. 135 (4): 1141–1153. doi:10.1093/brain/aws038. PMC 3326257 . PMID 22396397. ↑ Kolb, B. Whishaw, I. (2011) An Introduction to Brain and Behavior, 592. ↑ Master, Z.; McLeod, M.; Mendez, I. (1 March 2007). "Benefits, risks and ethical considerations in translation of stem cell research to clinical applications in Parkinson's disease". Journal of Medical Ethics. 33 (3): 169–173. doi:10.1136/jme.2005.013169. PMID 17329391. ↑ Marti, M; Mela, F; Budri, M; Volta, M; Malfacini, D; Molinari, S; Zaveri, NT; Ronzoni, S; Petrillo, P; Calò, G; Morari, M (February 2013). "Acute and chronic antiparkinsonian effects of the novel nociceptin/orphanin FQ receptor antagonist NiK-21273 in comparison with SB-612111.". British Journal of Pharmacology. 168 (4): 863–79. doi:10.1111/j.1476-5381.2012.02219.x. PMID 22994368. ↑ Heiberger, Lisa (2011). "Impact of a weekly dance class on the functional mobility and on the quality of life of individuals with parkinson's disease". Frontiers in Aging Neuroscience. 3. doi:10.3389/fnagi.2011.00014. 1 2 Cuesta MJ, Sánchez-Torres AM, de Jalón EG, Campos MS, Ibáñez B, Moreno-Izco L, Peralta V (26 Sep 2013). "Spontaneous Parkinsonism Is Associated With Cognitive Impairment in Antipsychotic-Naive Patients With First-Episode Psychosis: A 6-Month Follow-up Study.". Schizophrenia bulletin. 40: 1164–1173. doi:10.1093/schbul/sbt125. PMID 24072809. 1 2 Baraduc, P; Thobois, S; Gan, J; Broussolle, E; Desmurget, M (Jan 9, 2013). "A common optimization principle for motor execution in healthy subjects and parkinsonian patients.". The Journal of neuroscience : the official journal of the Society for Neuroscience. 33 (2): 665–77. doi:10.1523/jneurosci.1482-12.2013. PMID 23303945. ↑ Horak, FB; Anderson, ME (August 1984). "Influence of globus pallidus on arm movements in monkeys. I. Effects of kainic acid-induced lesions.". Journal of Neurophysiology. 52 (2): 290–304. PMID 6481434. ↑ Desmurget, M; Turner, RS (March 2008). "Testing basal ganglia motor functions through reversible inactivations in the posterior internal globus pallidus.". Journal of Neurophysiology. 99 (3): 1057–76. doi:10.1152/jn.01010.2007. PMID 18077663. ↑ Shiner, T; Seymour, B; Symmonds, M; Dayan, P; Bhatia, KP; Dolan, RJ (2012). "The effect of motivation on movement: a study of bradykinesia in Parkinson's disease.". PLoS ONE. 7 (10): e47138. doi:10.1371/journal.pone.0047138. PMC 3471921 . PMID 23077557. ↑ Solla, P; Cannas, A; Ibba, FC; Loi, F; Corona, M; Orofino, G; Marrosu, MG; Marrosu, F (Dec 15, 2012). "Gender differences in motor and non-motor symptoms among Sardinian patients with Parkinson's disease.". Journal of the neurological sciences. 323 (1-2): 33–9. doi:10.1016/j.jns.2012.07.026. PMID 22935408. ↑ Gibb, WR; Lees, AJ (September 1988). "A comparison of clinical and pathological features of young- and old-onset Parkinson's disease.". Neurology. 38 (9): 1402–6. doi:10.1212/wnl.38.9.1402. PMID 3412587. ↑ Grigor'ev, AI; Fedorov, BM (Mar–Apr 1996). "Stress under normal conditions, hypokinesia simulating weightlessness, and during flights in space.". Human physiology. 22 (2): 139–47. PMID 11541518. ↑ Wolterink, G; Van Ree, JM (Mar–Apr 1988). "Stress-induced hypokinesia is facilitated by ACTH-(7-10).". Peptides. 9 (2): 277–82. doi:10.1016/0196-9781(88)90260-4. PMID 2836824. ↑ Kim, EJ; Lee, B; Jo, MK; Jung, K; You, H; Lee, BH; Cho, HJ; Sung, SM; Jung, DS; Heilman, KM; Na, DL (July 2013). "Directional and spatial motor intentional disorders in patients with right versus left hemisphere strokes.". Neuropsychology. 27 (4): 428–37. doi:10.1037/a0032824. PMID 23876116. ↑ Bracht, T; Schnell, S; Federspiel, A; Razavi, N; Horn, H; Strik, W; Wiest, R; Dierks, T; Müller, TJ; Walther, S (February 2013). "Altered cortico-basal ganglia motor pathways reflect reduced volitional motor activity in schizophrenia.". Schizophrenia Research. 143 (2-3): 269–76. doi:10.1016/j.schres.2012.12.004. PMID 23276479.